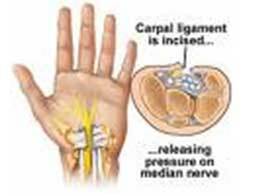 How Can Massage Therapy help Prevent and Treat Carpal Tunnel Syndrome? Massage therapy can provide valuable assistance to someone suffering from CTS, either as a stand-alone treatment, or in conjunction with other modalities. Massage can also assist in prevention of the syndrome; when treatment is started early enough, muscle hypertonicity is decreased, and edema can be reduced. Treatment will depend on the actual cause and stage of presentation of the condition. For example, in a case where repetitive stress is the cause, the therapist will attempt to decrease hypertonicity and myofascial trigger points of the brachium, ante-brachium, all of which are proximal to the site of compression. This can be achieved by doing deep work to the muscles of the arm and forearm, as well as stretching of the forearm flexors. If the structures in the carpal tunnel are impinged due to thickening or scarring of the flexor retinaculum, friction therapy to break down the tissue can be invaluable, if painful, to reduce compression. Manual lymph drainage can assist in the reduction of fluid build up post treatment. The therapist may also stretch the carpal ligament and palmar tissue & fascia, reducing compression of the structures, and finish with a cold hydrotherapy application on the site to reduce any inflammation. Outside of surgery, there is no “cure” for carpal tunnel syndrome which results from hypertonicity of the forearm flexors. If CTS is caused by a repetitive stress injury (RSI), then maintenance will be necessary. Maintenance in this case will involve a program of stretching, hydrotherapy, massage therapy and possibly a wrist brace. The use of ergonomically correct keyboards for those whose work involves a lot of typing can also be useful. Depending on the severity of the condition, a treatment plan may involve a few weeks of treatments 2 times per week, in addition to a homecare plan to reinforce the effects of the treatment. As hypertonicity of the forearm flexors is reduced, the frequency of the treatment is reduced to once a week for several weeks. If you have questions concerning the treatment plan, your massage therapist should be more than willing to discuss it with you.